"With grilling season still in full swing, you can never have enough new and exciting ways to enjoy beef. This is the main course-size version of a fabulous Thai appetizer, strips of beef marinated in Asian spices, skewered, and grilled for a truly amazing combination of flavors. I think you should try this very soon." Place ginger, garlic, onion, brown sugar, fish sauce, vegetable oil, soy sauce, coriander, cumin, turmeric, and cayenne pepper into a mixing bowl; whisk into a smooth marinade. Bruise lemon grass by hitting it lightly several times with the back of a large chef's knife; mince the lemon grass and add to the marinade. Cut beef sirloin into strips about 2 1/2 inches long and 1/8 inch thick. Thoroughly mix the beef into marinade until all beef strips are completely coated, about 1 minute. Cover bowl with plastic wrap and marinate in refrigerator for 2 to 4 hours. Remove beef from marinade and shake off excess marinade. Thread 1/4 the meat onto each metal skewer. Arrange skewers on the preheated grill and cook until the meat stops sticking to the grill, about 1 to 2 minutes. Flip skewers over onto other side and cook until meat is well browned and shows grill marks, 2 to 2 1/2 minutes. Turn onto first side again and cook until meat is still slightly pink, 2 more minutes. Transfer to a platter and let skewers rest about 2 more minutes before serving. 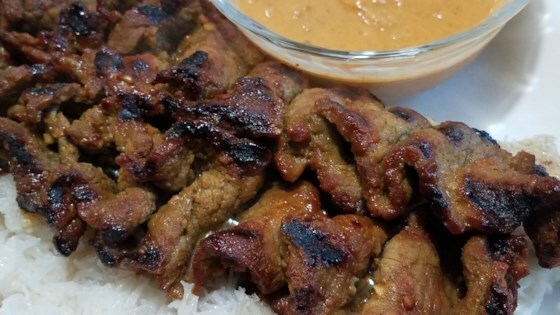 An incredibly delicious marinade makes amazing grilled beef satay. My whole family loved this recipe - including my picky little eaters. So flavorful and tasty. Served with brown rice and broccoli - a perfect meal. After reading the comments, I became very excited to make this. My family was not let down.